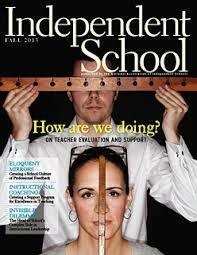 So I have finally caught up with the Fall 2013 edition of Independent School Magazine. I mistakenly judged the magazine based on a particular image, and that image deterred me from picking it up earlier. However, vacation has given me time to reconsider my initial impression. Count me in as a major fan. This issue focuses on teacher evaluation and support. In his anchor article, Robert Evans does not shy away from revealing the flaws of many independent schools (my title for this post comes from that article). Here are some key excerpts. The teaching I get to see [in independent schools] is not usually poor, but it is often pedestrian. Nonetheless, students generally do well. They ought to. There is abundant evidence that non-school factors (socioeconomic status, level of parents’ education, family stability, and the like) play a much larger role in most children’s achievement than do school inputs. And independent school students are the most teachable in America: they are typically bright, motivated, and well-behaved, and they typically come from supportive, upper-middle-class families. Plus, they are generally placed in small classes and their teachers generally have small pupil loads. Given all this, the essential question is not whether the outcomes are good, but are they as good as they should be? Ouch. Double ouch. No resting on our laurels, folks! I love the ideas inside the pages of I.S. Lisa Cetroni, Beth Miller, and April Waylett do a great job laying out several quality instructional coaching and peer support structures. I am intrigued by Erica Hamlin’s model of multi-year evaluation and compensation at University Prep in Seattle. I am grateful for the McDonogh School and others for promoting The Folio Collaborative. Thanks as well to Marc Baker and others for bringing up the complex role of the head of school in the area of instructional evaluation. So many great practices to consider. Good people have written volumes on the subject of teacher evaluation. Most have understandably focused on public schools, and the topic often becomes political between unions and districts, giving independent school educators a convenient excuse to sidestep the conversation altogether. But surely we could all agree that all teachers deserve to be evaluated via a system that adheres to the basic standards that Grant Wiggins recently elucidated. Standards can and should be the same for everyone in the field, although we might have some different priorities (I will share some of mine in a future post). Autonomy in the classroom is a great asset. But so is professionalism, peer collaboration, and institutionally-supported growth and renewal. What would I change about this issue of I.S.? The cover. For me, this image evokes the notion of a static, one-time classroom evaluation measuring irrelevant information — or worse. Doesn’t a wooden ruler measuring head size raise the spectre of scientific racism? As a history teacher I am probably more sensitive to that interpretation than others. Regardless, this cover image does little to convey the initiatives described within. Readers, let the words speak for themselves this time around. ADDENDUM: Clearly, the editors intended a humorous entry into the magazine. I am 100% positive that they had no ill intent. In my reckoning, their plan just did not work out as originally intended. I think the guy on the cover could be you. Are you just cranky that they used a photo you don’t like? Seriously, I think you’re right on here. I have the privilege of supervising and evaluating teachers at an excellent public school, and it’s a huge and constant undertaking. And one of the worst high school classes I ever saw was at a very expensive independent school – small class size and motivated middle class students will cover for a lot. It would be interesting to see what it looked like if independent schools developed a strong coaching and evaluation culture. Would it look like good public school practice? Or would it be different?